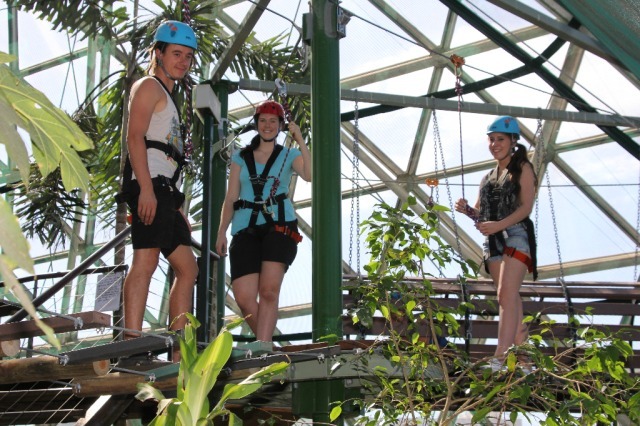 The Cairns Zoom is the world's first Challenge Ropes Course in a wildlife immersion exhibit, situated in the heart of Cairns City. 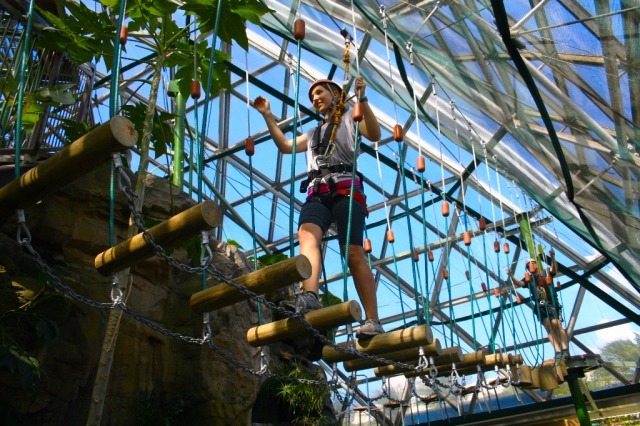 Test your strength and bravery on more than sixty-five different crossings over two height levels, encompassing a climbing wall, log bridges, tunnels, swinging beer kegs, skateboards, seesaws, cargo nets and more. 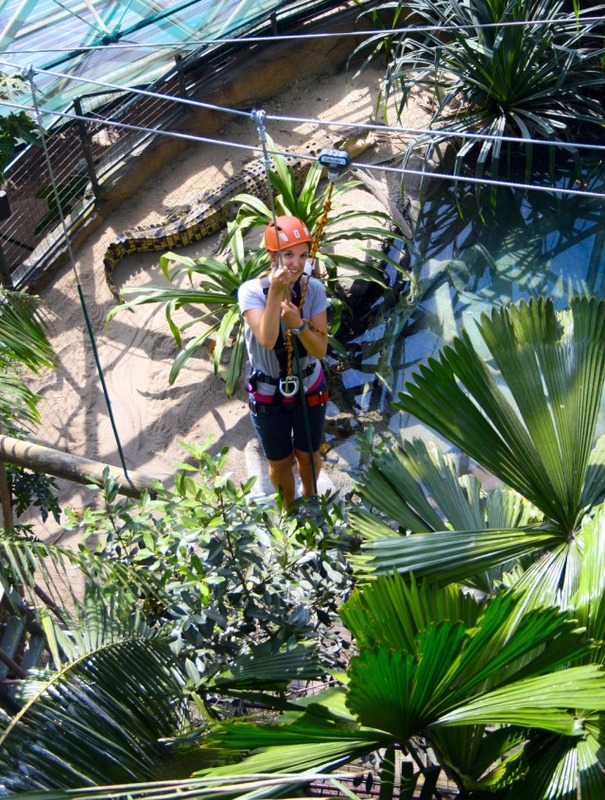 ZOOM over the top of Goliath - a 4m Crocodile!! The Mid Course, is an easy level of difficulty and is suitable for young people, and as an introduction for the Hi-Zoom. Start out on a 30cm high training element before exploring 27 different elements including: a spider’s web, seesaw, chairs and a snakes and ladders climbing wall. 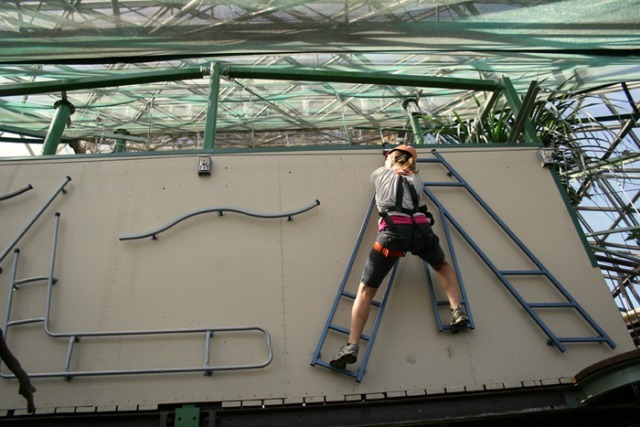 Reaching no more than 3 metres in height, the mid-course is more suitable for participants afraid of heights. 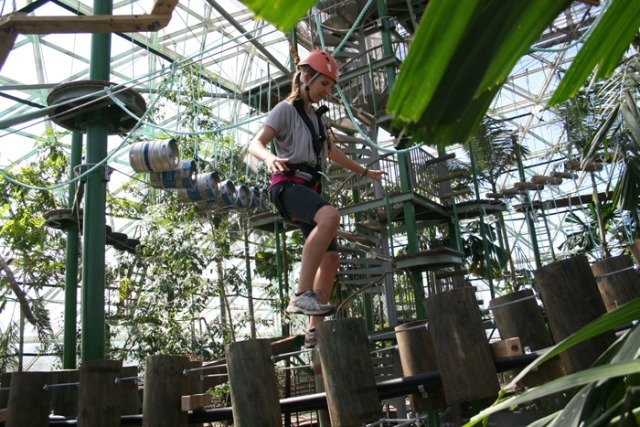 The High Course is a medium to hard level of difficulty suitable for older children, and young and older adults alike. 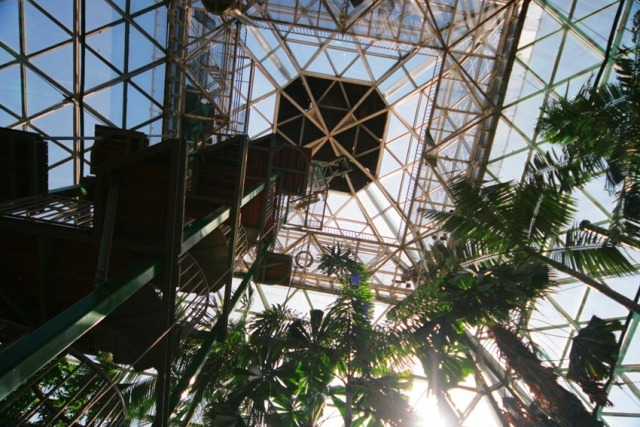 Some elements of the Hi-Zoom are very difficult, high among the treetops and may take a few attempts. 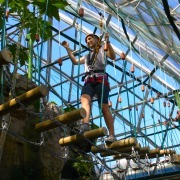 Participants will enjoy crossings such as the Beer Kegs, Tyre Wire, Walk the Plank, Dodge Ball, and the Cargo net. 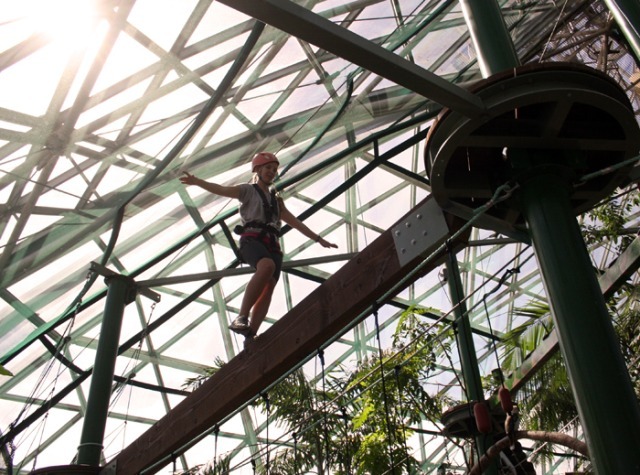 Ranging from 5 metres to 10metres high into the Dome, the high course is a test for those who are afraid of heights, and a testament to those who succeed. 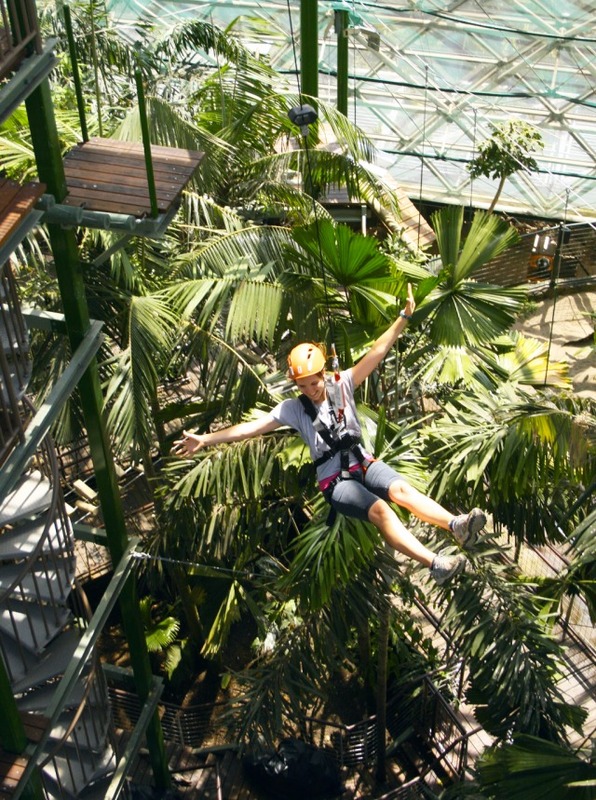 There are four Ziplines throughout the high course with varying heights and lengths. 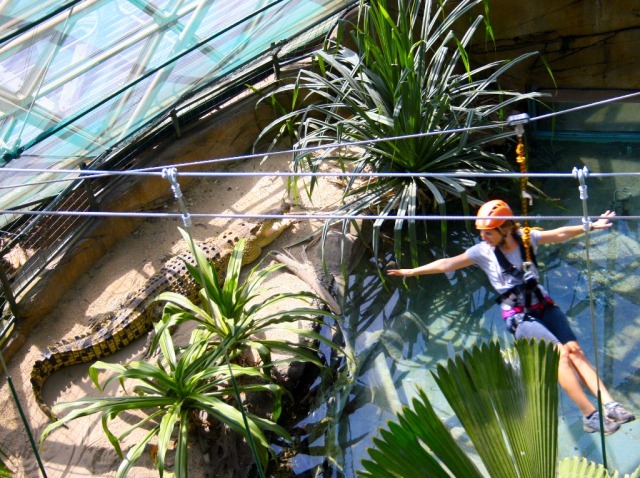 The main attraction is the Zip line which takes participants over the top of the Crocodile pond which houses Goliath, who at almost 4 metres is the Dome’s largest inhabitant. 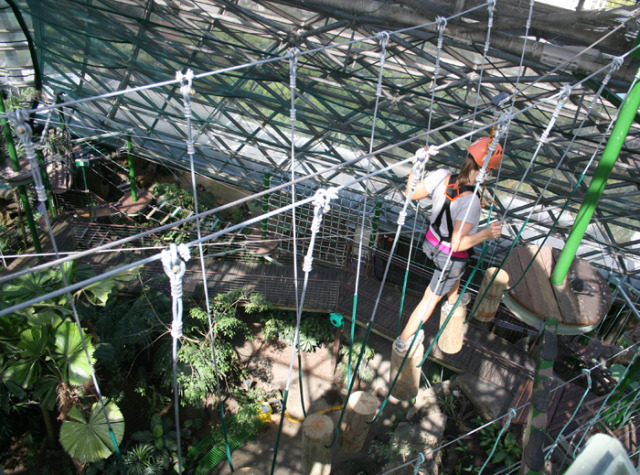 An easy level of difficulty - walk along internal walkways of the dome and take a bird’s eye view of the entire Ropes Course, before stepping outside to the external platform. 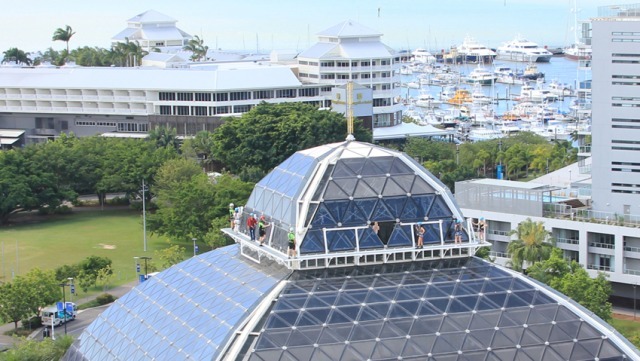 The External Walk is an exhilarating scenic walk around the outside perimeter of the Cairns Wildlife Dome providing the only elevated 360° view of the Cairns City, the Pacific Ocean, Trinity Inlet, the Cairns Marina, The Esplanade, and the mountains of the Lamb Range. The PowerJump’s, Powerfan is a highly engineered machine that is able to provide the freefall adventure of your life, in safety and without needing to deploy a parachute or strap yourself by the ankle to a bungee cord! 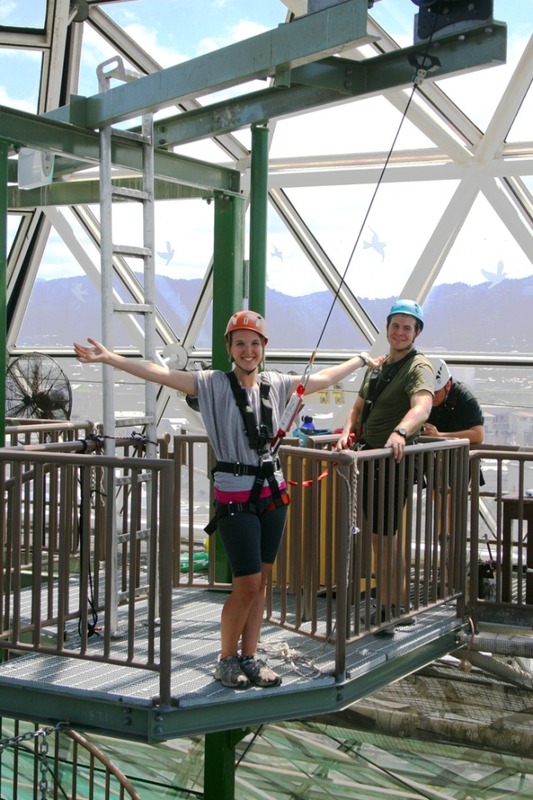 This exhilarating element is a free fall adventure where you jump off a 13m high tower attached by rope to make a rapid descent, with a fan device ensuring a gentle and smooth landing on a trampoline. 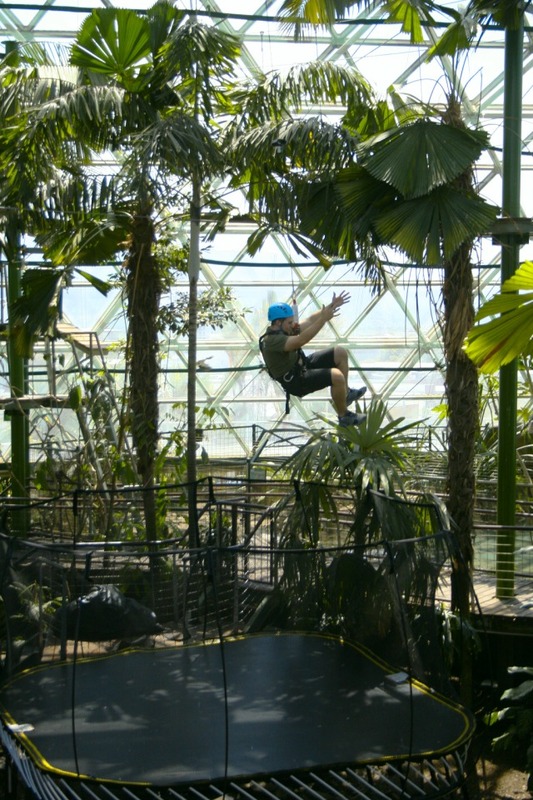 Between 120cm and 140cm tall can participate in the Wildlife Dome, Mid-Zoom and the Dome-Climb. 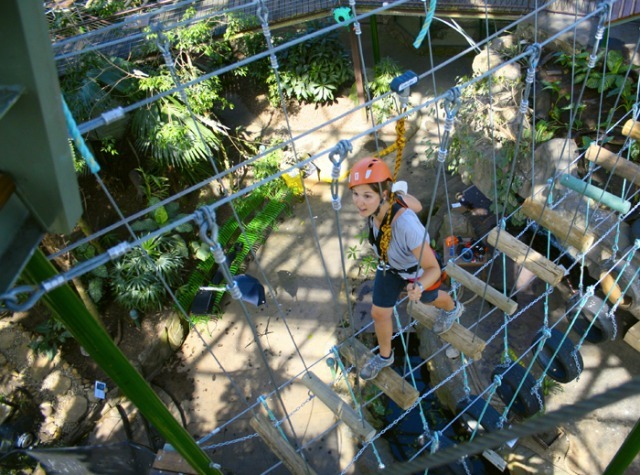 Participants taller than 140cm can participate in all activities. 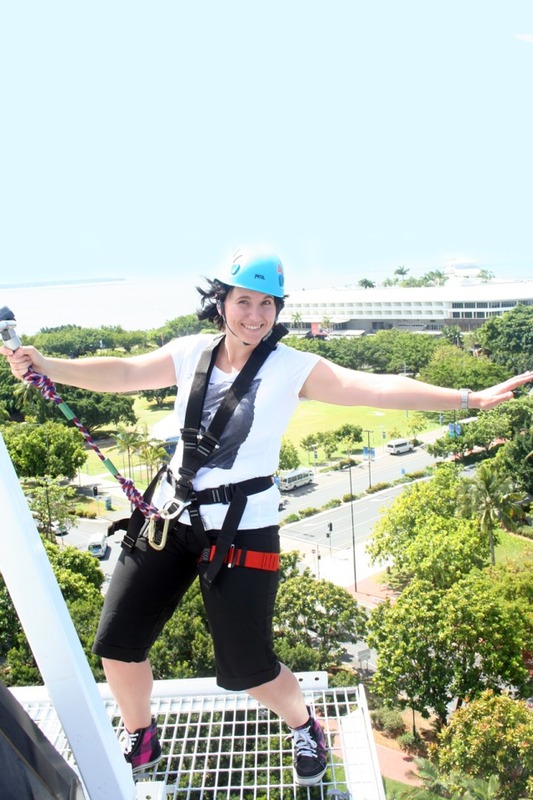 Participants must be 120kg or less, & fit into the Harness & Helmet. 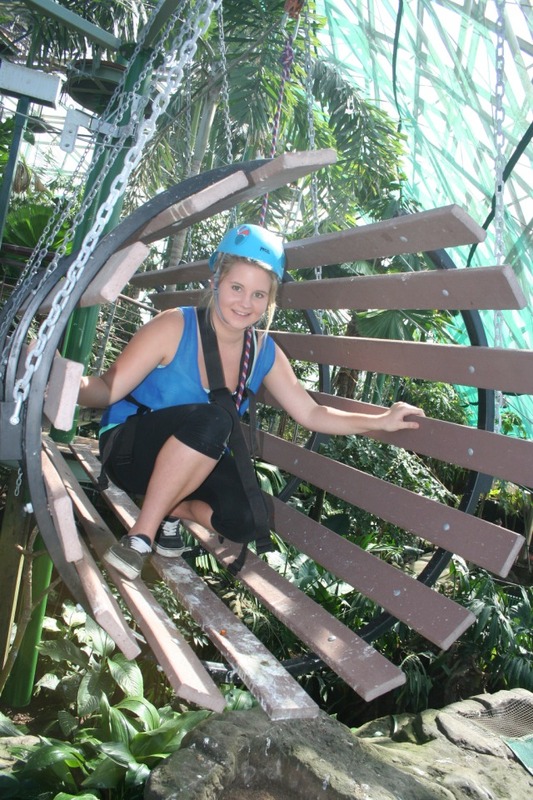 The complete Cairns Zoom Adventure Course takes approx 2 hours. 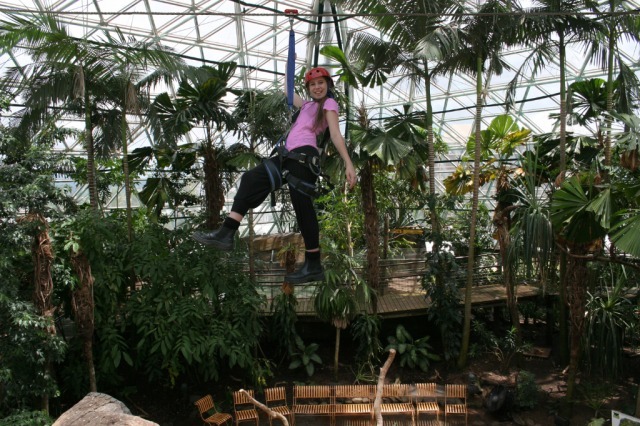 One Adult is required to supervise every 2 children between the heights of 120cm and 140cm. 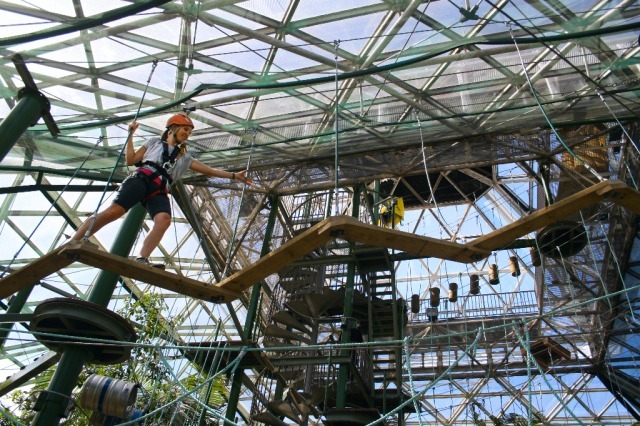 Each Activity ticket is valid for any of the Activities at the Cairns Zoom, so you can choose to do any combination of activities, or repeat the same activity multiple times. We had a great day at zoom. Highly Recommended family activity. My 7 year old and his best mate did the low and high course.